There was once a multi-headed, consensual priesthood named SAARC which started out with seven priests and later added an eighth. It tumbled along for 30 years, not achieving great fame and fortune, but not hurting anyone either. It was at least a forum for the clergy to gather around the altar and sway to the hymns of regionalism. That is the story of SAARC, which has been placed in suspended animation under Narendra Modi, who is out to teach Pakistan a lesson for being recalcitrant in so many regional initiatives. The latest being a SAARC motor vehicles agreement that was being prepared for signing at the November 2014 SAARC Summit in Kathmandu. The erstwhile Gujarat Chief Minister Modi started his term as Prime Minister of India as a regionalist, inviting the neighbouring presidents and prime ministers to his inauguration darbar in May 2014. He also unilaterally announced a SAARC Satellite to be launched by India to help development work in regional countries, a good initiative that could nevertheless have benefited from prior consultation. The crucial departure point was marked by Modi’s address at the 18th Summit at the newly refurbished City Hall, where he delivered the finely crafted lines: “The bonds will grow. Through SAARC or outside it. Among us all or some of us. We can all choose our paths to our destinations.” The next departure was India’s refusal to attend the 19th Summit slated for Islamabad following the militant attack on Uri in September 2016. The chairmanship would also have passed from Nepal to Pakistan in Islamabad. Pushpa Kamal Dahal as Prime Minister of Nepal and concurrent Chair of SAARC had no capacity or inclination to argue with Modi even as he watched the application of the tranquiliser syringe. The other heads of government also proved unwilling to take on the Delhi juggernaut. Islamabad did not protest too loudly either, preoccupied as it was with its own political turmoil and its attempts to reach out to Central Asia, China, Iran and the Gulf emirs. South Asian regionalism was thus allowed to slide in a manner that does not do justice to a region with nearly a fourth of the world’s population, with its shared history, and the need for economic growth and social justice. With all its obvious weaknesses, SAARC signifies acceptance by the rulers of the need for peace, stability and cooperation in southern Asia. Besides losing three decades, allowing SAARC to gather dust on the top shelf would mean massive lost opportunities, and lead to exacerbated tensions among the region’s countries. It would also push Pakistan further away from the South Asian fold, denying our civilisational history that began in the Indus plains. Certainly, SAARC could not function without participation of the second most populous member. The entire BIMSTEC Secretariat, officers and staff, headquartered in Dhaka, have moved to Kathmandu for the foreign minister’s summit here this week, while the SAARC Secretariat at Thamel is jobless. The new SAARC Secretary General from Pakistan is finally at his desk, but there is no saying when he can get really active – much hinges on when Narendra Modi decides that the time is right to allow the 19th Summit to happen. For now, the Indian prime minister seems intent on excluding Pakistan from regional activities, and does not seem shy even of using BIMSTEC for the purpose. The ‘outcome document’ signed at the BIMSTEC Summit in Goa in October 2016 included a pointed reference to Pakistan in the paragraph condemning terrorism. BIMSTEC was started in June 1997 as a sub-regional grouping for inter-state cooperation, the acronym originally signifying ‘Bangladesh, India, Sri Lanka, Thailand, Myanmar – Economic Cooperation’. With the accession of Nepal and Bhutan in 2004, a title was required to justify the original acronym, and hence the Bay of Bengal Initiative for Multi-Sectoral Technical and Economic Cooperation. Quite a mouthful. The overall collaborative regional format for the nation-states of South- and Southeast Asia should be such that organisations are complementary and cross-cutting. SAARC should prosper and so must BIMSTEC, and while the regionwide SAARC may emphasise peace, security and economic cooperation, the sub-regional grouping may more efficiently manage infrastructure and socio-economic matters. 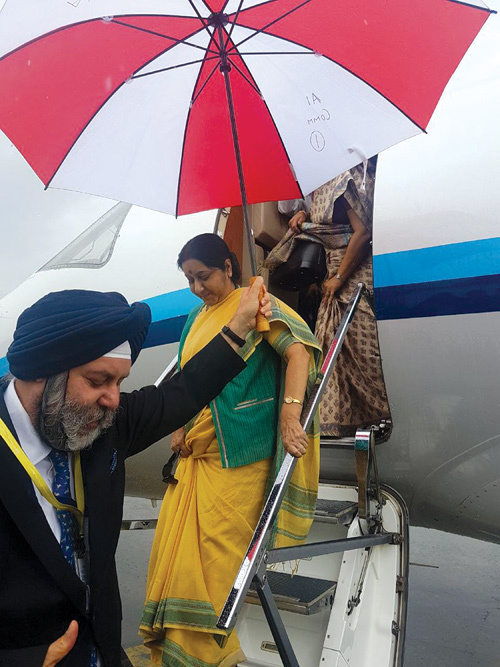 India’s interest in promoting BIMSTEC should therefore be seen as positive and forward looking, while its insistence on putting SAARC in cold storage must be critiqued. A weakening SAARC can only make South Asia a more dangerous place, which is why we must try to get SAARC back on its feet. The first step for which would have to be holding the 19th Summit in Islamabad. As current chair of both SAARC and BIMSTEC, Nepal has the responsibility to move both organisations forward. Prime Minister Sher Bahadur Deuba, whose country hosts the SAARC Secretariat, must in his forthcoming visit to New Delhi try to convince Narendra Modi on resuscitating the organisation. When smoke spews out of the chimney, the brick factory comes alive.